12 prints randomly selected from 28 options. Mesa Contemporary Arts (MCA) Museum is proud to announce its Ninth Annual Original Print Calendar for 2018! 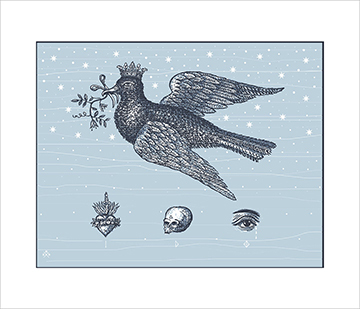 The prints, ranging from relief prints to screen prints as well as etchings to lithographs, are all hand produced on acid free paper and adhered to the calendar with photo corners for easy removal for framing. Each of the twelve months has a different print and no two calendars are alike. This limited edition calendar, with only 65 available for purchase, is a great way to begin your own art collection or give as a unique holiday gift. 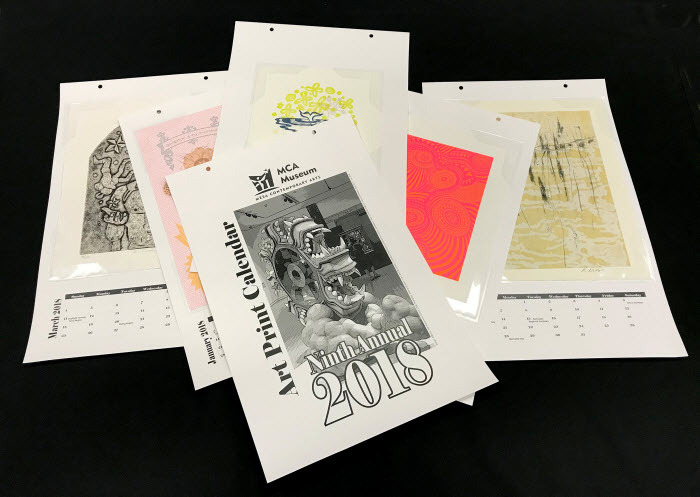 The juror for the 2018 Mesa Contemporary Art Museum Original Print Calendar was Jean Makin, who was the Curator of Prints and Graphic Designer at the ASU Art Museum for 27 years until her retirement in 2016. The calendar will premiere during MCA Museum's BidUP! Silent Auction Fundraiser on Saturday, Nov 18, 2017 (6-8pm), where all of the prints will be on display in the museum's lobby. Purchase by December 9 will receive $5 off per 2018 calendar. To pre-order this year's calendar as well as purchase the previous years, please complete this form. Calendars that require shipping will be mailed the following week. Mesa Arts Center Duo Level Members get 10% off each calendar. Backstage and above receive 20% off each. Brent Bond, Conception of the Minotaur, 2017, Letterpress, linocut, multi-plate photopolymer relief and archival inkjet on patterned paper. Janet Towbin, 1966, 2017, Two-Color Block Relief from MDF and Laser-cut Linoleum. Printed at Santo Press.